LAST SERVICED:	2012/06/26, Serviced every 100 hours of run time. TYPE OF GEAR BOX: Ziff, new in 2010. TYPE OF PROP:	3 blade fixed prop, replaced in 2010 - spare on boat, spare prop-nut, key etc. YEAR:	House batteries replaced in 2010, engine and generator new in 2012, bow thruster replaced in 2009. METHOD OF CHARGING: Alternator for house and engine stater, shore or generator for all. SOLAR PANELS:	Yes, 420 Watt, can produce 150 Amp-Hour of power or more. MAKE:	Norpro 6.5 KVA, 75 A 120 V, 730 hrs as of 2012-June-19. note:	Can run both air conditioners and fridge. LAST SERVICED:	2012/06/06, Serviced every 6 months. HOURS RUN/DATE:	730 as of 2012-June-19. ACCUMULATOR:	Yes, replaced in 2009. STANDING RIGGING MATERIAL: Stainless steel wire. LAST REPLACED:	October 2011 by East Port Yatch Services, Annapolis, MD. RUNNING RIGGING MATERIAL: Core braided line, inspected by Eastport in 2012 all newer than 2009. MAINSAIL REEFING:	Three quick reefing points, reaf 1 on mast, reaf 2 and 3 lead to cockpit. 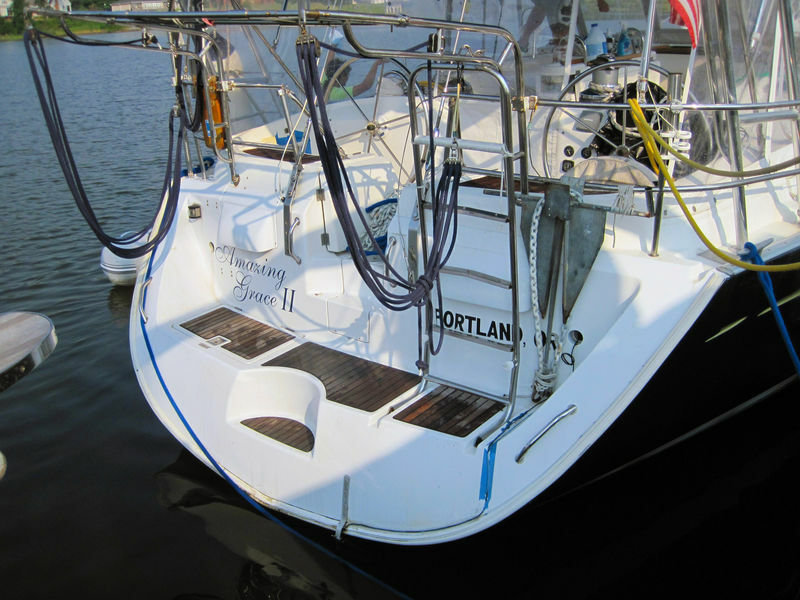 HEADSAIL ROLLER FURLING: Profurl, replaced in 2011 by Eastport. SPINNAKER POLE:	Yes, Aluminum - on mast for storage. TYPE:	Lose footed full batten main. 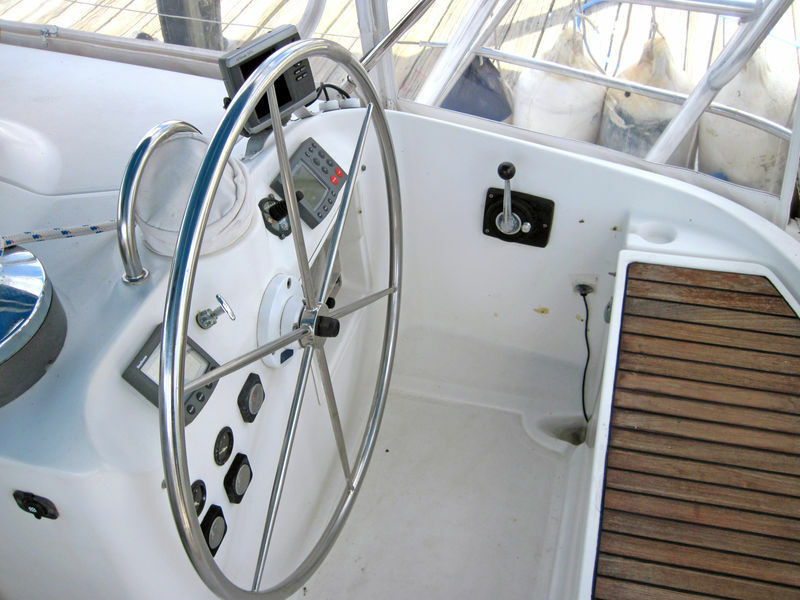 LINES IN COCKPIT:	Yes, lines except jib halyard, topping lift and 1st reef on main are lead to cockpit. MISC. WINCHES:	3 on mast, 1 for reefing. FRIDGE:	SeaFrost engine driven cold plate and 120 V shore power or generator. FREEZER:	SeaFrost engine driven cold plate and 120 V shore power or generator. note:	Both fridge and freezer doors were reinsulated to R50 in 2009. ICEBOX:	Both firdge and freezer can be used as an icebox and have a pump to remove water. WHICH LAYOUT VERSION: 3 cabin owners version. PRIMARY ANCHOR: Delta 84 LB with 130 feed of chain and 300 feet of rope. SECONDARY ANCHOR: Delta 45 LB with 40 feet of chain and 200 feet of rope. STERN ANCHOR: Danforth with 10 feet of chain and 300 feet of rope. head connected via NMEA 183 to Chartplotter. SPRAYHOOD/DODGERS:	Yes, Full Enclosure, EZ2CY on front is perfectly clear. SUN AWNING:	Yes, Full Enclosure, EZ2CY on front is perfectly clear. RADIO / Single Side Band:	Yes - ICOM 710 Pro with automatic antenna tuner. Ground plane replaced in 2011. RADIO / VHF:	Yes - ICOM 500 with remote in cockpit. OUTBOARD ENGINE BRACKET:	Yes, on rail. LIFERAFT:	Yes, 4 person, new in 2009. Has hydrostatic automatic deployment. Mounted on deck. PAPER TOWEL HOLDER:	Yes, in galley paper towel holder that will not dump the paper towels. FENDERS:	Yes, 5, 2 very large. DOCK LINES:	Yes, 7/8" braid on braid. POWER CORD:	Yes, 2 40' with 50 amp adapter. NOTE: 11 Through Hulls - all the ones that showed any sign of wear or had stiff through hull valves - replaced in 2011 and 2012.